This week the Moon is well on its way toward Last Quarter, which occurs at 7:47 AM Saturday, Oct 30th. Forecasts call for several clear evenings into the weekend, an excellent opportunity for a little night sky observing -- especially since the Moon won't rise until after 11:00 PM CDT. During the latter part of the week, yellow-bright Capella is shining in Auriga, well up in the northeast by mid-evening. Look off to its right in the east for the Pleiades, or Seven Sisters. The beautiful Pleiades (PLEE-ah-deez,) star cluster is also known as Messier 45 (M45), one of the original 103 objects Charles Messier catalogued in 1771 as objects to avoid while comet hunting, which was his main passion. Messier's list became better known to history as the first list of interesting non-stellar objects in the night sky. 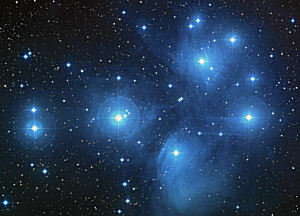 The Pleiades are probably the most well-known star cluster visible to the naked eye. A group of young, blue-hot stars surrounded by nebulosity, the cluster is thought to be less than 100 million years old. By contrast, the Sun is thought to be more than 4.6 billion years old. In Japan, the Pleiades cluster is known as Subaru, and is graphically depicted as the corporate logo for the automaker of the same name. 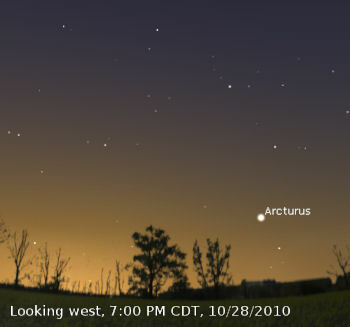 Every year for several days around October 29th, the bright star Arcturus, in Boötes, takes a special position sparkling in the fading twilight low on the west-northwestern horizon. This position marks the spot where, months earlier in June and July, the Sun stood at the exact same time of the evening. Then, the summer daylight was still strong in the evenings, now the autumn light is fading and this much smaller, scintillating gem is all that remains in the west, the Ghost of the Summer Sun, marking the mid-point of autumn. Jupiter still shines high in the southeast between Pisces and Aquarius rising high into the south-southeast as the evening wears on. Right now, it is by far the brightest star-like point in the sky. 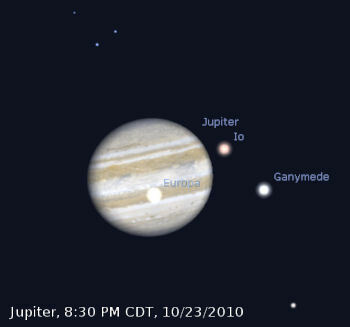 Jupiter continues to appear a big 47 or 48 arc-seconds wide in a telescope or binoculars. Once again, the tiny black shadows of two of the Galilean Moons, Europa and Ganymede, fall on Jupiter's face from 11:16 PM CDT Saturday evening to 1:59 AM CDT Sunday morning. These can only be caught with the aid of a small telescope -- binoculars won't do. Saturn is visible in Virgo, low in the east in early dawn. The best time to try observing it with a telescope is in moderately bright morning twilight, perhaps an hour before sunrise, when it will be less blurred by the low-altitude atmospheric mess. Saturn's rings have opened to 7° or 8° from edge-on, and so are more prominent than they were just a few months ago. Uranus is still within 3° east of Jupiter. Neptune, in Capricornus, is high and almost due south at about 9:00 PM CDT. Hey kids! Harness the wind and the sun! Power up a whole town without creating any pollution or greenhouse gases. “Power Up!” is the new game on NASA’s Climate Kids web site. In this game, your progressive town gets all its energy from wind turbines and solar panels. You have just two minutes to capture enough wind and solar energy to light up all the windows in all the houses of the town. If you succeed, you win the Platinum Award for clean energy. If just a few windows are still dark, you win the Gold. Silver and Bronze Awards are good, but you’ll learn to do even better. Try this fun new game at http://climate.nasa.gov/kids/powerupcleanly. 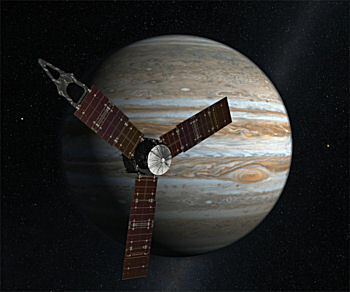 The Juno mission, arriving at Jupiter in July 2016, will help to solve the mystery of what’s inside the giant planet’s core. Jupiter and Earth just had a close encounter — and it was a good one. In late September 2010, the two worlds were 31 million km (about 19 million miles) closer than at any time in the past 11 years. Soaring high in the midnight sky, Jupiter shone six times brighter than Sirius and looked absolutely dynamite through a backyard telescope. Planetary scientist Scott Bolton of the Southwest Research Institute isn’t satisfied. “I’d like to get even closer,” he says. 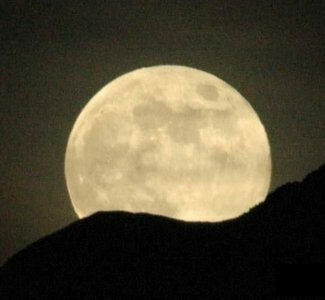 The Full Moon occurs this week at 8:37 PM, CDT on Friday, October 22nd. The nearly full Moon washes out the sky for the entire night on Wednesday and Thursday evenings, since it will rise before sunset and will not set again until nearly dawn. However, the Moon rises about 30 minutes later each evening, so by Tuesday, October 26th, the waning gibbous Moon will not be in the sky until after 9:00 PM CDT. Although both the bright glow of the Moon and the weather forecast don't look favorable for astronomical observing this week, you may still be able to catch a glimpse of Comet 103P/Hartley in binoculars or a small telescope. Look for it in the constellations Auriga and Gemini in the eastern sky at about 12:30 AM CDT. Whether you'll see the comet or not depends to a great degree on the quality of the sky when you make the observation. This week, the Big Dipper asterism in Ursa Major lies level in the north-northwest after dusk, quite low, far below the bowl of the much dimmer Little Dipper (Ursa Minor). 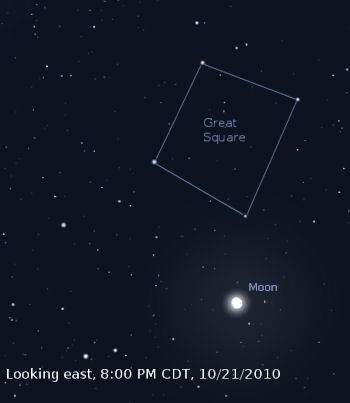 On Thursday evening, the Great Square of Pegasus asterism is straight above the waxing gibbous Moon after dark. The Great Square is tipped on one corner and somewhat larger than your fist held at arm's length. The Great Square is actually part of two constellations - its namesake Pegasus, and Andromeda. Mars is getting dimmer at magnitude 1.5, which is still fairly bright as astronomical objects go. Mars continues to linger very low in the southwest right after sunset. Even with the moon glow, bright Jupiter is an easy target in the constellation Picses. Jupiter is still within its first month past opposition, and has just passed a very close approach to Earth, — perfectly positioned for viewing mid-way up the east-southeastern sky, reaching its highest point at about 11:00 PM. On Saturday, October 23rd, see if you can catch the tiny black shadows of both Ganymede and Europa as they pass across Jupiter, from 8:40 to 10:04 PM CDT. Saturn is back as a morning planet, just emerging from the sunrise glow. Look for it in the constellation Virgo, very low in the east about an hour before sunrise. It's within 1° of fainter Gamma Virginis. Neptune, at magnitude 7.8 in Capricornus, is still highest in the south about an hour after sunset. With the expected sky conditions this week, Neptune will be a difficult target. You will need a small telescope to catch it. The weather this week will be absolutely perfect for sky-watching, with low humidity providing above-average transparency all week and the temperatures low enough after dark to make it very comfortable. By Wednesday, the Moon will not rise until 11:03 PM CDT, late enough that the glare will no longer interfere with evening observing. The Moon reaches Last Quarter at 10:53 PM CDT on Thursday evening, though it will not rise until after midnight. Moonrise occurs about an hour later each night. With the Moon gone from the evening sky, now is the time to start looking for Comet 103P/Hartley (Hartley 2.) Comet Hartley 2 is just now becoming visible, reaching magnitude 5.9 on Wednesday evening. Comet Hartley 2 should brighten to magnitude 5.4 by Tuesday evening. The comet will continue to brighten in magnitude over the next three weeks. 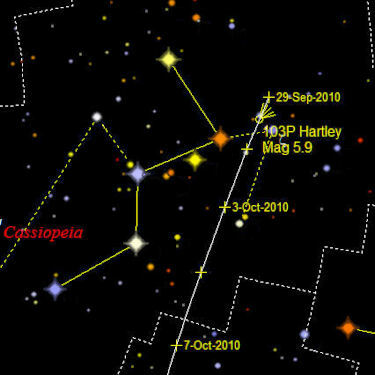 Wednesday evening, 103P/Hartley lies in the north-northeast, in the constellation of Cassiopeia, the Beauty Queen, approximately 0.87 above Zeta Cassiopeiae. 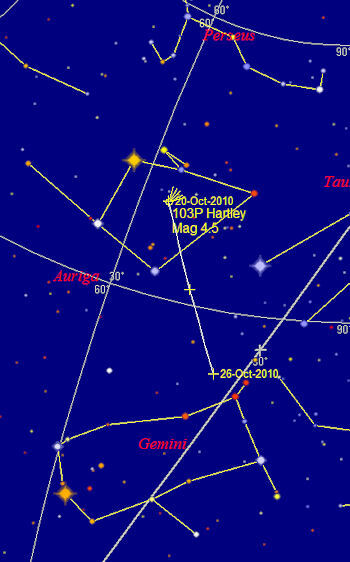 Over the course of the week, Comet Hartley 2 will track down to the southwest, as shown in the finder chart. At magnitudes dimmer than 5, you will need binoculars or a small telescope to see Comet Hartley 2 in any but the darkest of skies. In late evening, as Jupiter rises high in the southeast, look for Fomalhaut, (pronounced FOAM-a-lot, or less commonly, FOAM-al-howt.) Fomalhaut is known as the Autumn Star, sparkling far to Jupiter's lower right in the south-southeast. The name Fomalhaut means "the mouth of the whale" in Arabic, and it is the brightest star in the constellation Piscis Austrinus, the Southern Fish. Uranus, at magnitude 5.7, is only 1° to 1.5° to the left of Jupiter this week, still close, but you may need to move a few field-of-view widths in a telescope or binoculars to spot it. Neptune is also a relatively easy target early in the evening on the border between Capricornus, the Goat-Horn, and Aquarius, the Water Bearer. Can you see any color in Uranus and/or Neptune? There should be just the tiniest hint of pale green in Uranus and an equally pale blue in Neptune. Even though Venus is at its brightest now at magnitude –4.8, it is becoming a thin, long crescent. Venus is sinking very low in the southwest during bright twilight, setting well before dark ahead of Mars, 6.5° to Venus's upper right all week. That's about one field-of-view width in a typical pair of 7 x 50 binoculars, which you'll definitely need to spot either of them. Mercury is still very bright at magnitude -1, and is a fine morning target for planet watchers. Once again this week, look for it low in the east about 45 minutes before sunrise. It sinks lower as the week advances, getting lost in the glare of the sun by mid-next week. After Venus sets, look to the west-northwest, and notice that five constellations form a line descending from the zenith down to the horizon. Remember from earlier articles that the zenith is the point directly overhead from your observing position. Near the zenith is the bright star Deneb: the head of the Northern Cross asterism, which is actually the tail of Cygnus, the Swan. 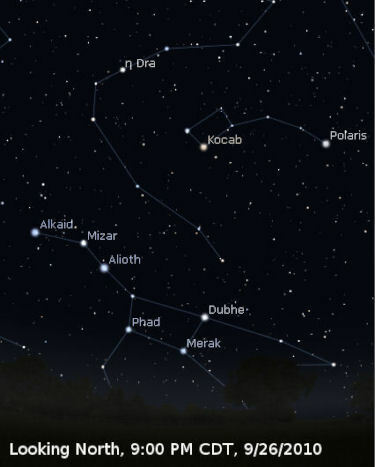 Next down is Lyra, the Lyre, with the bright star Vega, then comes dim Hercules, the Kneeler, the then little Corona Borealis, the Northern Crown, and finally big Boötes, the Herdsman, with bright reddish Arcturus low in the west-northwest. Hiding in Hercules is one of the most beautiful jewels of the night sky, the Great Cluster in Hercules (M 13,) the brightest globular cluster in the northern hemisphere. 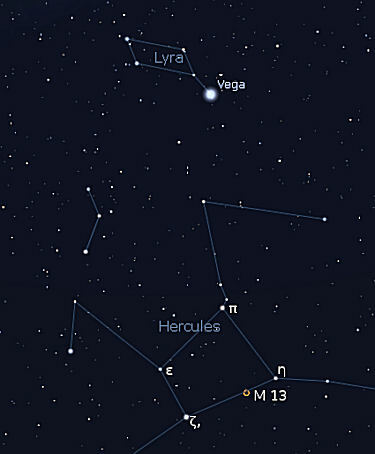 M 13 lies two-thirds of the way along the longest side of the Keystone asterism, a quadrangle in Hercules formed by the stars Pi (π,) Eta(η,) Zeta(ζ,) and Epsilon (ε) Herculis. Look about mid-way up to the zenith in the west-northwest for the Keystone, and then look to the north end of the longest side to find M 13,in a clear dark sky, it should be visible as a fuzzy patch slightly larger than a star. A telescopic view reveals a myriad of stars swarming around in a big ball — about a hundred thousand of them in all. 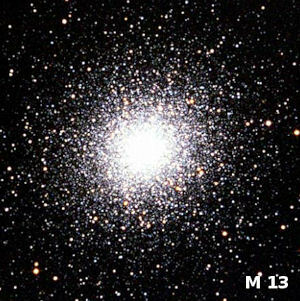 M 13 is a spectacular sight on a crisp clear night like the ones we'll have this week, and should not be missed. I am writing every Astronomy Club and Astronomical Society that I can, individually, to ask for your assistance in saving the Bell Labs Horn Antenna from ruin. I am not selling anything nor am I asking for money. This is not SPAM nor is it an automated email. If you are like me, you are not an activist at heart but just want to enjoy the science of astronomy with friends and associates. To do this we are, as Sir Isaac Newton put it so succinctly, “Standing on the shoulders of giants”. Arno Penzias and Robert Wilson were not the tallest of those giants but they did make a revolutionary discovery when they used the Horn Antenna to discover the Cosmic Microwave Background Radiation left from the Big Bang creation of the universe. Penzias and Wilson were awarded Nobel Prizes and went on to have successful careers. The Horn Antenna underwent a much different fate. It was soon surpassed by newer technology and abandoned. In 1989 it was awarded the status of a National Historic Landmark and you would have thought that having that status would have provided it with the care and maintenance it required and deserved. Unfortunately, that was not the case. The National Park System has no power to force the owners and caretakers of National Historic Landmarks to provide any care at all. Because of this, it was easy for Alcatel-Lucent Technologies, the company that took over Bell Labs in Holmdel, New Jersey, to simply ignore their civic obligation. A personal visit to the site revealed to me that they had done just that. I ask that you look at the web site that I have created, www.hornantennatoday.com and to recommend it to the members of your Astronomical organization. Once you have seen what has become of that once great technological marvel I hope that you will feel the sadness and anger that I feel. If you do, I ask that you email Paul Ross, Director of Corporate Communications for Alcatel-Lucent Bell Lab at, Paul.Ross@alcatel-Lucent.com and urge that the Horn Antenna be donated to either the National Radio Astronomy Observatory in Green Bank, West Virginia or The Smithsonian Institute in Washington D.C. Please let me know that you have done this so that, once they know that I am not alone in this quest, I can contact them again and try to lead them to the proper decision. Any help that you provide will be very helpful and appreciated more than you will ever know. Sometimes I feel like Don Quixote on his lone quest. I thank you for your time and cooperation. Wednesday evening, Jupiter and Uranus were almost directly below the full Harvest Moon, which is officially full at 4:18 AM CDT Thursday morning. Also on Wednesday evening, the Autumn Equinox for the Northern Hemisphere occurred at 10:09 PM CDT. This time of year, the equinox marks the beginning of Autumn at the point when daylight and darkness are the same length. The Full Moon closest to (either preceding or following) the Autumn Equinox is known as the Harvest Moon. In any given year, the Harvest Moon can occur as early as September 8th, or as late as October 7th. This year, however, the Harvest Moon and the Autumn Equinox occur on the same night. Some astronomers refer to this event as a Super Harvest Moon. The coincidence of these two events happens about once every twenty years, and so the event is relatively rare. The “Super Harvest Moon” nickname seems to be a relatively recent invention, but as young as it is, it has made its way into the media this year. One unusual aspect of a Super Harvest Moon is that “twilight” is truly what the term implies — two separate light sources, the Sun and the Moon, are directly opposite one another in the sky. Therefore the Earth is bathed completely in light from both sides. As a result, the evening light takes on an unusual appearance, and can be seen for about three days surrounding the Equinox. 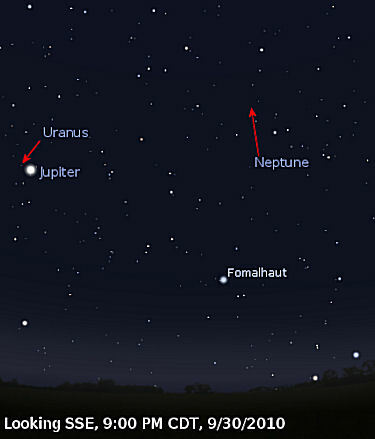 Jupiter and Uranus are still very close together this week and can be spotted in a wide-field telescope or binoculars. See if you can pick out the Galilean Moons in a pair of binoculars as well. This time of year after nightfall, the dim Little Dipper (Ursa Minor) is upside down (you'll need a fairly dark sky,) and looks like it's dumping water into the bowl of the Big Dipper (Ursa Major) far below it. Perhaps this is a harbinger of the coming autumn rains! Venus, is very low in the southwest during brighter part of twilight. It sets before dark, but is visible as it is at its brightest point of the year at magnitude -4.8. Mars is quite a bit dimmer than Venus at magnitude 1.5, and is 6° or 7° to Venus's upper right all week. A pair of binoculars may mean the difference between spotting Mars or not. Mercury is brightening from magnitude 0.0 to –0.8. Look for it low in the east about 45 minutes before sunrise. Look for Regulus twinkling above or to the upper right of Mercury, rising higher every morning. Regulus marks the base of the Sickle, an asterism in the constellation Leo. Neptune and Uranus are both visible in the evening sky this week, but may take some patience to spot. 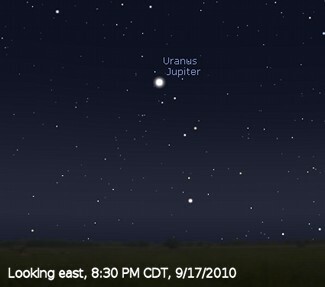 As mentioned earlier, Uranus is very close to Jupiter and can be easily found in binoculars. Neptune, however, will probably require higher magnification. See last week's Backyard Astronomy article for help in finding Neptune. On Monday and Tuesday evening, the waning gibbous Moon will not rise until after 9:00 PM, giving us a wonderful opportunity to get a good view of NGC 869 and NGC 884, a pair known as the Double Cluster, in the constellation Perseus. 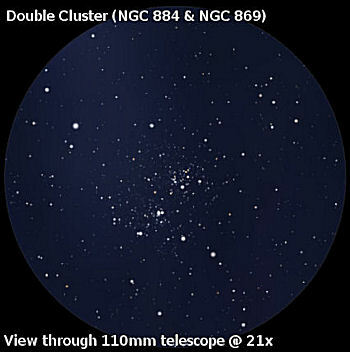 The Double Cluster is a beautiful pair of large open clusters that are actually visible to the naked eye when viewed from a dark sky. They can be found in the seemingly empty space between Perseus and Cassiopeia in the northeastern sky. A low-power view through binoculars or a telescope reveals a myriad of tiny points of light sparkling in the darkness. A beautiful sight for anyone! 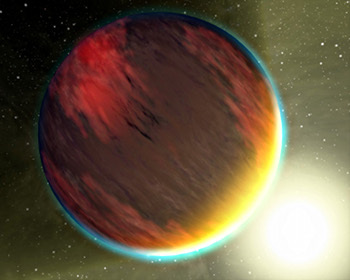 Artist’s rendering of hot gas planet HD209458b. Both the Hubble and Spitzer Space Telescopes have detected carbon dioxide, methane, and water vapor — in other words, the basic chemistry for life — in the atmosphere of this planet, although since it is a hot ball of gas, it would be unlikely to harbor life. Up near the top of their list this decade is the search for Earth-like planets around other stars — called “extrasolar planets” or “exoplanets” — which has become one of the hottest topics in astronomy. The first planet to be found orbiting a star like our Sun was discovered in 1995. The planet, called “51 Peg b,” is a “Hot Jupiter.” It is about 160 times the mass of Earth and orbits so close to its parent star that its gaseous “surface” is seared by its blazing sun. With no solid surface, and temperatures of about 1000 degrees Celsius (1700 Fahrenheit), there was no chance of finding life on this distant world. Since that discovery, astronomers have been on the hunt for smaller and more Earth-like planets, and today we know of around 470 extrasolar planets, ranging from about 4 times to 8000 times the mass of Earth. This explosion in extrasolar planet discoveries is only set to get bigger, with a NASA mission called Kepler that was launched last year. After staring at a single small patch of sky for 43 days, Kepler has detected the definite signatures of seven new exoplanets, plus 706 “planetary candidates” that are unconfirmed and in need of further investigation. Kepler is likely to revolutionize our understanding of Earth's place in the Universe. We don't yet have the technology to search for life on exoplanets. However, the infrared Spitzer Space Telescope has detected molecules that are the basic building blocks of life in two exoplanet atmospheres. Most extrasolar planets appear unsuitable for supporting life, but at least two lie within the “habitable zone” of their stars, where conditions are theoretically right for life to gain a foothold. Explore Spitzer’s latest findings at http://www.spitzer.caltech.edu. Kids can dream about finding other Earths as they read “Lucy’s Planet Hunt” at http://spaceplace.nasa.gov/en/kids/storybooks/#lucy. This week, the Moon is just past First Quarter, and shines to the left of the handle of the Sagittarius Teapot on Friday evening. Watch over the course of the next week, and you can observe the waxing gibbous Moon appear farther eastward in the sky at the same time each night. This is a good time to view most of the planets in the Solar System. On Friday and Saturday evenings, Uranus will come within 0.8° of Jupiter. Uranus is easily visible in binoculars at magnitude 5.7, just to the north of mighty Jupiter, who is nearly 3,000 times brighter at magnitude –2.9. In binoculars or a small telescope with a low-power eyepiece, Pale-green Uranus appears about as bright as one of Jupiter's four Galilean Moons. Mercury is should be clearly visible low in the east about 45 to 30 minutes before sunrise all this week. It's easy to confuse Mercury with Regulus in the dim light of dawn. Regulus lies almost directly above it at the base of the Sickle of Leo. Venus is now setting in the west before dark, and Mars is about 6° to the right, just above her. 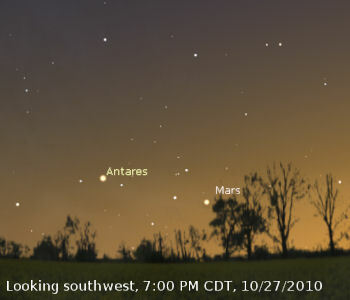 Mars is almost lost in the glow of sunset, so you may need binoculars to get a good view. Jupiter reaches opposition on the night of Monday, the 20th. Opposition occurs when Jupiter is directly opposite the Sun in the sky as seen from Earth. Rising just after dusk in the east southeast, Jupiter is the brightest object in the sky after Venus sets. This year at opposition, Jupiter will be closer to Earth than at any other time from 1963 to 2022, and even though it's only about 1% to 2% larger than the preceding and following oppositions, Jupiter now appears nearly 49 arc-seconds wide. With the South Equatorial Belt still nearly invisible, the Great Red Spot is easy to identify in a small telescope. Saturn is now completely lost in the glow of sunset, and won't be visible again until late October, when it appears in the eastern sky at early dawn. 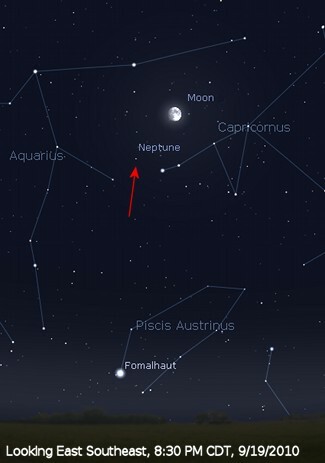 Neptune, at magnitude 7.8, is visible in east-southeast about an hour after dark, and lies between the constellations of Capricornus and Aquarius. You can pick it out from a good dark-sky site, and a telescope will reveal it's pale, blueish-tinged disk. Did you know about the supposedly “secret” US spaceplane? 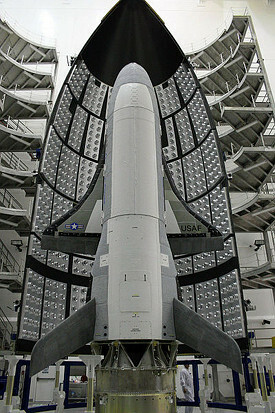 X-37B, the unmanned successor to the space shuttle, launched from Florida in April 2010 and began its first mission with very little public notice – because no one knew where it was going or what it was doing. The spaceplane was shrouded in operational secrecy. However, civilian specialists reported that it might go on mysterious errands for as long as nine months before touching down again. Even though the X-37B mission was — and remains — secret, amateur astronomers first identified it after observing the object and determining it was orbiting the Earth once every 90 minutes at an inclination of 39.99 degrees. They then shared their findings with other amateurs, who have confirmed their observations and helped determine that the object was indeed the X-37B. If the weather allows, you can catch the X-37B as it passes overhead every night this week. The X-37B does not reach anywhere near the brightness of Iridium Flares or even the International Space Station (ISS), but with magnitudes between 5.5 and 2.2, you can spot it if the conditions are right. The brightest passes occur on Saturday and Sunday evenings at magnitude 2.2 and 2.3 respectively. Look for it to pass high at altitude 85° in the south-southwest on Saturday evening at 8:35 PM CDT. Look again on Sunday evening at 7:51 PM CDT, only this time it will be at altitude 78° in the north-northeast. The ISS makes one pass overhead this week, at magnitude -0.8. Look for it to pass low in the southwest at 7:50 PM CDT on Friday, the 17th. There will also be several very bright (magnitude -8.0) Iridium Flares visible right at dusk this Thursday, Friday and Saturday. Check out the specific times and celestial coordinates for the X-37B, ISS, and Iridium Flares at the Heavens-Above web site. The Last-Quarter Moon occurs at 12:22 PM CDT on Wednesday afternoon. Fortunately, moonset occurs before dusk until early next week so we are lucky to have dark skies in the evening for observations. 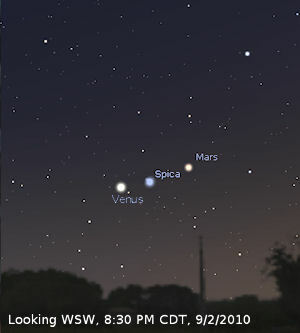 On Wednesday and Thursday evenings, Venus, Spica, and Mars form a fairly straight line about 5° long, low in the west-southwest about a half hour after sunset as shown in the illustration. Despite how it appears in the image, Venus is over 175 times brighter than Spica, even though Spica is the brightest star in the constellation Virgo! 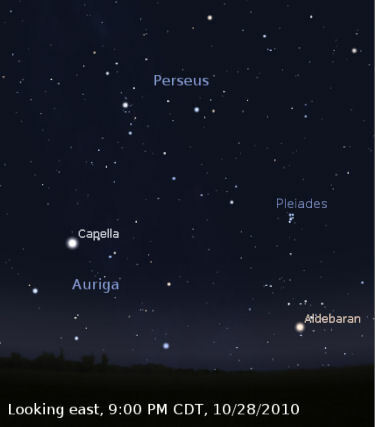 Beginning in September, the Great Square, an asterism in the constellation Pegasus has risen well up in the eastern sky after dark. The Great Square appears to be balanced on one corner, the sign of autumn to come. This year, bright Jupiter becomes a helpful landmark, shining to the lower right of the Great Square. 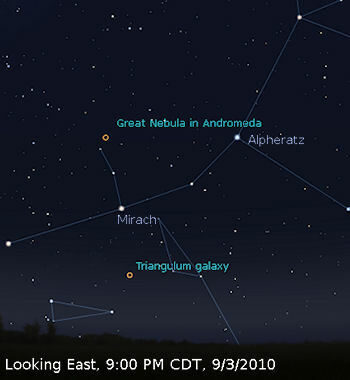 The lower left corner star in the Great Square is Alpheratz, which is actually in the constellation Andromeda, rather than Pegasus. From Alpheratz, follow the stars of Andromeda in a diagonal line down to the left of the Great Square, to Mirach, the second star from Alpheratz in the line. Then follow a line straight up from Mirach to the next brightest star, Mu Andromedae (μ And), and then beyond that to an even dimmer star, known as Nu Andromedae (ν And). Directly above and to the right of ν And, you will find the Great Galaxy in Andromeda, or M31. Also known as the Andromeda Galaxy, at a distance of 2,500,000 light years from Earth, M31 is one of the most distant galaxies in the night sky that can be seen from Earth with the naked eye. If you find the right combination of a dark night, good transparency, and you've taken the time to get your eyes dark-adapted (1.5 hours or more,) you should be able to see this wonder of the heavens as a dim smudge just above ν And. A good pair of binoculars will bring the smudge out to a very prominent hazy streak across the field of view. M31 is actually 6 times larger than the Full Moon when viewed through a large telescope, but the surface brightness is so low that you only see the center of the galaxy with the naked eye or binoculars. With a small telescope, see if you can pick out the two companion galaxies, M32 and M110. 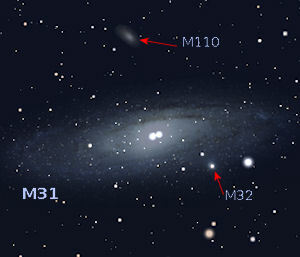 In a medium-sized telescope (8" - 12",) you should be able to see a wonderful image of the galaxy, including M32 and M110. It's almost as good as a photograph! Like M31, M33, the Triangulum Galaxy, Is another great deep sky target, and it lies just below Mirach in Andromeda, and above and to the right of the constellation Triangulum. 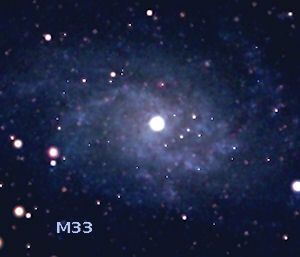 M33 is also visible to the naked eye in the right conditions. The Triangulum Galaxy is somewhat more distant from us than M31 at 3 million light years. That's a long way to see without any kind of optical aid! Although both are spiral galaxies, the Triangulum galaxy presents itself to us face-on, so we can see the spiral structure much more prominently than we can with M31, which is situated at an angle to us. Along with the Milky Way and the Andromeda Galaxy, the Triangulum Galaxy is part of the Local Group of galaxies, being the third largest. The Local Group also includes about 30 smaller galaxies. The galaxies in the Local Group are gravitationally bound together, so as a whole, they move through space as one, even though the individual members are moving around within the group - sort of like a swarm of bees!